•	The multinational company that delivers modules and inverters for PV solar installations has 44 companies in its International Network of Qualified Installers in these two countries. •	In alignment with its strategy for emerging PV markets, the company has opened two new branches, which add to the previous ten. 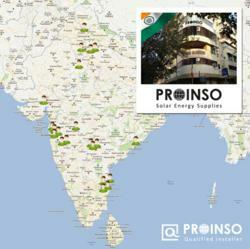 •	In India, PROINSO supplied 35 MW of solar products to five projects in Gujarat (25 MW) and Maharashtra (10 MW). •	In Australia, PROINSO has supplied around 30 MECASOLAR solar trackers for different projects. 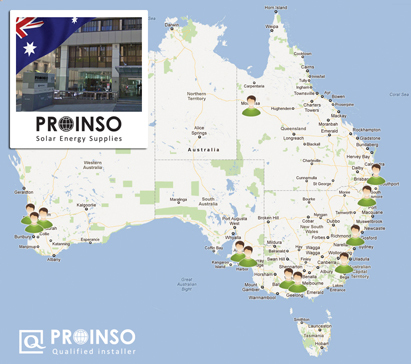 PROINSO, a company that supplies modules, inverters, trackers and fixed structures for roof- and ground-mounted solar PV systems, is growing globally, and it has announced the opening of two new branches in Australia (Brisbane) and India (Mumbai). So currently, with these two new branches, PROINSO has a total 12 around the world, which confirms its interest in emerging solar PV markets. At present, PROINSO has 32 Indian and 12 Australian Qualified Installers in its International Network. They are local companies with at least three years’ experience in the solar industry and have teams of engineers and installers capable of designing and carrying out solar projects. The new branches in both countries will provide services to existing installers and try to attract new installers and customers. Besides, they will have products in stock to be delivered as soon as installers need them. The multinational company has delivered products to different PV projects in both India and Australia. Last year, PROINSO supplied 35 MW to five solar PV projects in India, a country whose solar energy market is expected to grow steadily over the next years. Solar energy in India has been estimated to reach over 20,000 MW installed by 2022. In late 2011, PROINSO participated in Intersolar India to great success. At the trade show, the company contacted a great many customers, and it is planning to attend the event once again this year. In Australia, PROINSO has supplied around 30 solar trackers for different projects and hopes to strengthen its presence in the country. At present, PROINSO has offices in Spain, Germany, Greece, Italy, France, USA, Canada, China, South East Asia, UK and Czech Republic, plus the two recently opened in India and Australia. PROINSO’S International Network of Qualified Installers is made of as many as 1,986 member companies around the world. As already announced, Australia and India are two of PROINSO’s target markets, alongside Mexico and Brazil, where the multinational solar PV company is working to grow stronger. Of the company’s total sales in 2011, 88% were exports. 83% went to European and North American countries, whereas the remaining 5% were sales in emerging markets. It is precisely in this sector that PROINSO expects to grow in the near future. PROINSO specialises in the supply of modules, inverters, fixed structures and trackers for PV solar stations. The company has distribution agreements with TRINA SOLAR, CANADIAN SOLAR, REC, SCHOTT Solar, JINKO Solar, YINGLI Solar and LDK Solar for modules, and with SMA, SOLARMAX and INGETEAM for inverters, and is a distributor of trackers and fixed structures from MECASOLAR. PROINSO is the world’s leading supplier of TRINA modules and the largest supplier of SMA inverters, being an international provider of the products manufactured by the German company.